Full disclosure: I know I'm in over my head (no pun intended). First off, I'm not much on beauty regimens. My own hair is typically in a pony tail. I wash it, sometimes I straighten it, but usually I run a brush through it and pull it out of my face. If I ever get a cut that needs to be styled, I like it for exactly the amount of time the hair stylist's work lasts. As soon as that responsibility is on me, I'm plotting out how long it will take to grow back or I go get it cut even shorter so I can, again, just run a brush through it and not think about it. 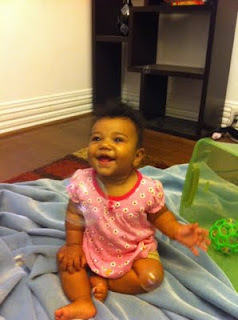 Secondly, I know that since my daughter is biracial (black/white) her hair will most likely be a big deal, culturally. I also know that as a white mother, I don't fully understand those cultural implications. When you add my fashion clueless-ness to my cultural distance, it's a cause for concern--one that I hope to rectify as much and as soon as possible. I read this post by Rebecca Carroll on Black Voices and see her say about Zahara's hair "I look at little Zahara Jolie-Pitt, as cute as she is, and I think, does Angelina Jolie have no black friends whatsoever?" I've watched Good Hair . I read this article on Love Isn't Enough by a woman who adopted a black daughter and explains "as it turns out there’s whole other curve, which is figuring out what Madison’s hair means and what her hair says about us, about her, and about her place in the African American community and what messages we send her as we care for it." That same poster goes on to talk about products marketed to "soften" her child's hair (read: chemically alter its texture). She takes the words out of my mouth when she says that "telling my daughter that I love her hair while I’m putting chemicals on it to fundamentally change it is a mixed message I don’t want to send. She is not beautiful DESPITE her curls; she is beautiful in part because of them. She is a whole package of perfection just as she is. Should she choose to change her hair when she’s older and cognizant of the broader social impact of her decisions, so be it; I will support her." And this falls in line with the advice that I've gotten from black, female friends, who have all echoed some version of "Don't perm her hair until she's old enough to decide for herself." Some told me stories of long-term damage from childhood perms. Some recounted not feeling comfortable with their curls until young adulthood. My daughter's hair is beautiful! I mean, I know I'm a little biased, but this is one adorable child, and her hair is a big part of her. It's a little wild and fun, and it fits her nascent personality so well. I also know that the shampoo I was using on it was not working. We started with the typical J&J shampoo, but it dried her skin out, so we switched to Aquaphor, which is great on her skin, but hell on her hair. It stripped her little curls and left them shapeless and dry. I asked for advice, and someone pointed me to Carol's Daughter Hair Milk . I held off for a while because it was only located in the Macy's across a state line, but we finally made a special trip to get it. They had trial size bottles for $9, and I picked one up and headed to the counter. The very friendly cashier (who happened to be a black lady) smiled at me and looked at my daughter kicking playfully in the stroller. "You don't want this one." She said. Oh? I thought. "Here." She walked to the shelf and came back carrying the "Lite" version of the Hair Milk. "Use this one. And it doesn't make sense to buy the trial size when you can get four times as much for twice the price. You can always bring it back if you don't like it, but trust me--you'll like it." So I bought it, and used it, and voila! Her curls came back bouncy and healthy. It felt like a small victory over what's shaping up to be a strange battle. As the white mother of a biracial daughter who studies race and rhetoric, I am very conscious of the importance of cultural sensitivity and the meaning behind messages and image. My hope is to instill in my daughter that she is beautiful and that, with that confidence, she can make the right decision for herself about her image and her style as she gets older. I am sure I have a lot more to learn. I had seen the Willow Smith mash-up, but not the original. I love this! Thanks!